Due to the rough sea all work scheduled for last night as well as a troll (net) for 6AM was cancelled. 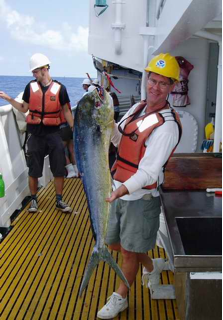 As we steamed eastward a couple of lines were trolled and did bring in two fish, a mahi mahi and ono . Both fish were kept. Their eyes were dissected for lens and retina and muscle samples were taken. TAS Geoff Goodenow shows off a mahi mahi. I learned more of the eye studies today from Kerstin. Longlining has taken a toll on sea turtle populations. Recently a judge ordered the practice stopped in Hawaiian waters due to the turtle by-catch. One way to avoid turtles is to utilize larger hooks and bait that turtles don’t like. As we set lines on this cruise we are employing those techniques. But Kerstin’s work with eyes is an attempt to learn of different sensory abilities in the different animals to see if those differences can be used to make catch by longline more selective. A web search under longlining will lead you to some articles about the by-catch issues. Plankton tow — We did one at surface for an hour then one at depth for another hour. It is preferred to tow through visible surface “slicks” where target larvae (those of billfish) like to gather. No slicks were found as they were probably broken up in last night’s rough water. These samples are being gathered (1) for the eye studies and (2) to be used to see if a genetic marker can be found that will be useful in identifying species in the larval stage. If found, identification will be much easier than doing so morphologically and will make reproductive studies easier. Tonight at 8PM we set our first baited longline. I started at the spool with “brake shoe” in hand poised for trouble that never came. After an hour or so of that I was “promoted” to bait boy–in the heart of the action! I kept the bait box full for Bruce as he attached the herring through the eyes to hooks. We set 180 pounds of fish on 400 hooks along 9 miles of line. Our leaders were metal tonight as our targets, sharks, can’t bite through the metal. Monofilament is used when the target is billfish because the metal leaders damage those animals in ways that monofilament does not. Every so often a temperature/depth recorder is attached to the line. About every 4th hook also gets a light stick attached as an attractant for fish. Buoys go over at regular intervals to help hold the line at desired depth and of course to mark its position. We will pick up the line after breakfast and see how well our efforts are rewarded. I was none too excited about getting out of bed this morning and leaving the prone position which had proved to be the most effective at preventing unpleasantries. But I had to make the move. The sea was still rough and sure enough that memorable sensation returned and put me on my knees before the toilet bowl once again. A couple of dry gags settled me, but I immediately headed to our physician assistant for appropriate meds. We found much calmer water on the west side of Hawaii and those of us who were quite unsettled this morning found our comfort growing through the day. Someone said swells/waves last night were 10-12 feet and coming from various directions. No wonder I felt as though I had been in a washing machine. How does the altitude of the sun (its angle above the horizon) at noon at 18 degrees north latitude compare with its altitude at 42 degrees north over the course of a year? To find out, use an analemma to find out the sun’s position with respect to the equator. Graph altitude (0-90 degrees) on the y axis and the 21st of each month on the x axis. Describe similarities and differences in the patterns. This entry was posted in 2004, Geoff Goodenow, NOAA Teacher at Sea and tagged analemma, Hawaii\, larvae, longline, monofilament, NOAA Ship Oscar Elton Sette. Bookmark the permalink.